When I first heard that Michael Feinstein would be coming to Broadway, I was thrilled. I love his recordings and I frequent his nightclub, Feinstein's at the Regency. Then I heard that it wouldn't be a solo show. Dame Edna, that cross dresser from Down Under, would be joining him. I had seen her perform at Children & Art, a benefit for Sondheim's Young Playwrights, five years ago. I was not a fan. However, not wanting to miss this performance by Michael, I accepted the invitation from their producers to see the show. 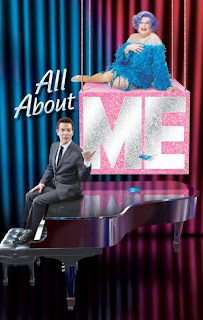 The show is titled All About Me. The premise is that each of these performers thought they were putting on their own solo show. I was pleasantly surprised! The evening, while at times awkward and/or silly, was highly amusing! Dame Edna had me holding my sides with her routine. How delightful she is! She is warm and silly and oh so sparkly. She changed costumes at least 5 times, each time changing into something even more sparkly and fabulous, and definitely outrageous. This comedienne, sort of a grand doyenne, is larger than life in so many ways. Sure, her singing voice is like nails on a chalk board, but she wins you over. And you won't see anything quite like her rendition of "Single Ladies"! Michael did spend a little time some of his vast knowledge of the great American songbook and I could listen to him sing all the live long day. However, he doesn't seem as at home standing in front of the terrific big swing band as he does behind the baby grand. Fortunately, the show is about half revue and half comedy, and Michael doesn't disappoint when he's crooning. This show is closing on Sunday, April 4th. To spend a delightful 90 minutes laughing and clapping along, get tickets via telecharge.com. Henry Miller's Theatre is on West 43rd, between 5th and 6th Avenue.